Ten years ago, Justine was one of five six-year-olds chosen to star in a documentary, aptly titled Five at Six. Five years ago, she and her costars returned for Five at Eleven. Lance and Leslie, the directors of the first two movies have just shown up, ready to put together Five at Sixteen. Only five years is a long time when you’re a teenager, and the six-year-olds that used to be friends once upon a time have grown up and gone in very different ways, some barely speaking to each other. They have new friends, new interests, and varying desire to put themselves in the spotlight yet again. Justine, the oddball, the funny one, who some called the breakout star, has turned out painfully average. Felix, talented yet always in the background, has embraced his dramatic side, and looks forward to being the center of attention. Keira, the confident, beautiful one, is hiding the pain of her family’s breakup. Nate, the quiet, down-to-Earth one, mostly keeps to himself. Rory, the weird one, has embraced her autism, and gotten over the way Justine abandoned their friendship. Despite initial reservations, the five agree to do this movie, but nothing goes according to plan. As six and eleven-year-olds, they were easy to shepherd and inspire and push into interesting paths, perfect for a documentary designed to play off their differences and commonalities. As teens, nothing comes easy, especially when it’s so hard to get them in the same room. But as their paths cross more and more often, they find themselves having the awkward questions raised by five years of estrangement. Can Lance and Leslie salvage a movie out of this rag-tag band of misfits? Well, things take a turn for the strange when Keira skips out on the film to find her mother, who left years ago. Justine, Nate, Rory ad Felix follow her to New York City, and that’s when they get down to the business of being themselves, bridging gaps and healing old wounds. At long last, they can talk to one another, and maybe even admit some of the hurts and secrets that have festered for so long. And with a borrowed camera in hand to document their adventure, Justine may just find her own calling. You Look Different In Real Life is a fascinating, wonderfully thoughtful, complex study of five different people who have grown up together, who know each other in intimate ways, and yet who don’t necessarily understand one another. Jennifer Castle adeptly chronicles their stories through Justine’s point of view, providing a powerful look at the paths they’ve taken as they matured. It’s also a nice look at how the spotlight affected them as kids and how they’ve dealt with it along the way. Two character arcs really stood out for me. The first, of course, was Justine’s. As the “character” who stole the show in the first two films, she’s almost crushed under the weight of expectations this time around. But she’s not sure she remembers how to be that kind of quirky, that sort of funny, that in-control. She’s the one least likely to come back, and the one who does it for the sake of her friends. But as she mends fences with Rory and gets closer to Nate, and reassures Felix when things seem bleak, as she discovers how good the camera feels in her hands, she visibly grows and matures. She reminds me a lot of Mark, from Rent, the one who stands apart from the others with only his camera to keep him company, who ultimately finds his connection with his pseudo-family. Rory is another character worth following. In her, Castle offers up a nuanced and sympathetic look at someone living with a form of autism. What came off as quirky and cute as a kid turned into something more offputting and alienating as a teen. However, Rory doesn’t let it define her, instead flourishing as she finds a passion in studying and recreating history. When she challenges her own limitations and attempts to step outside her comfort zone, it’s both beautiful and painful. This isn’t to say that Nate, Felix, and Keira don’t have their own stories, and their own roles to play. On the contrary, they’re important pieces to the larger puzzle. It’s just that Keira’s desire to reunite with her mother is easier to understand and less complicated than the other stories, while Nate’s story is quiet, less intrusive, more…well, understated. And as for Felix, he goes through a lot of growth, forced to confront something he’s never really considered, and that takes its own courage. The strength of these intertwined stories and the rich characterization drives this story, with Castle slowly revealing just what happened between eleven and sixteen to drive the five friends apart and send them on their separate orbits. If you ask me, this book didn’t even need the mild romantic subplot that simmered through most of the story, only coming to a head at the very end. It almost felt out of place, like something thrown in to appease those who expect every YA to include a romance of some sort. If none of these characters had hooked up with anyone else, if they’d just continued to pursue their paths, that would have worked just as well. Normally, I’m not a fan of sequels to stories like this. You know when the story’s over and when it comes to move on. I’m even less a fan of sequels that take place years later, because the characters are frozen in time and you don’t really want to think of them growing up and turning into adults with adult problems. However, I’d happily pay to see a sequel that followed the Five at Twenty-One, just to see where these characters ended one last time. 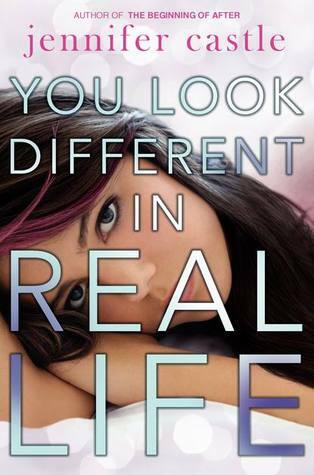 You Look Different In Real Life is a heck of a book, filled with awkward conversations and honest emotions. Between the cast and some wonderfully-rendered supporting characters, it also offers up a fair amount of diversity, which is always welcome. Frankly, this is the sort of book where I just can’t find anything worthwhile to complain about, and that makes me very happy indeed.